This may sound different than anything you have ever tried, but trust me. 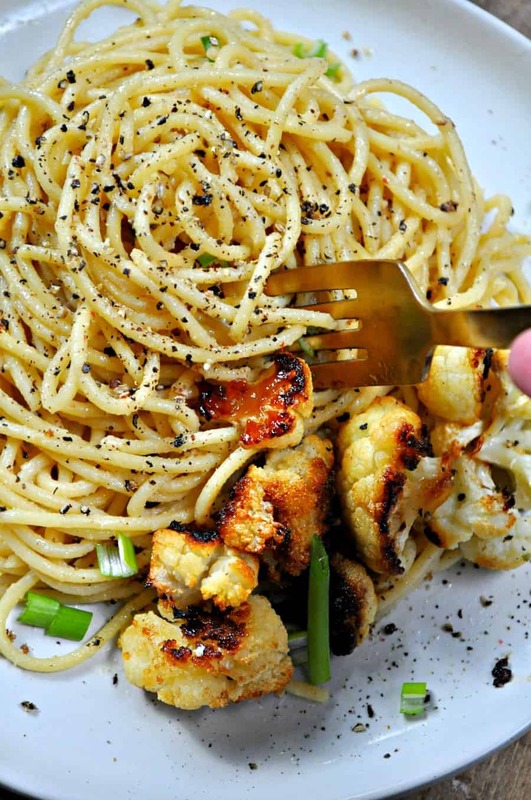 This vegan caramelized cauliflower cacio e pepe will be one of the greatest things you have ever eaten. 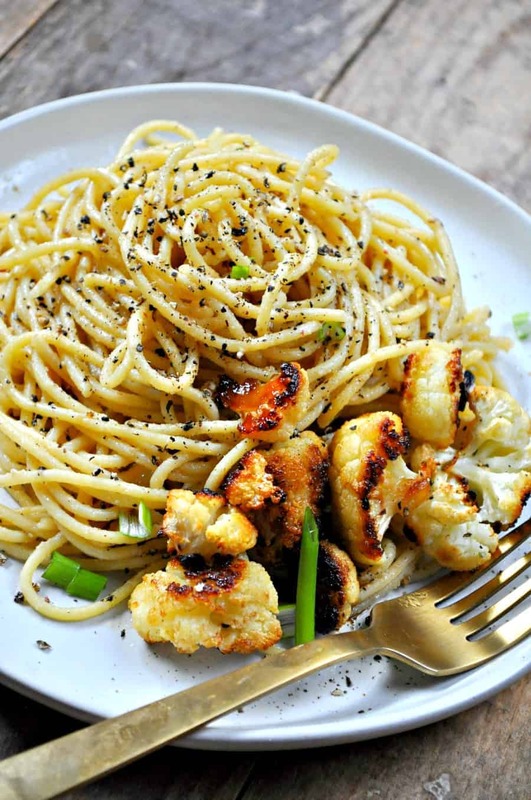 Cacio e pepe is a traditional Italian dish that literally means cheese and pepper. This quick and easy pasta is vegan and yet still perfectly cheesy by using vegan butter, pasta water and nutritional yeast. Then a crap ton of fresh cracked pepper. It is so F’in good. Seriously just the vegan cacio e pepe alone is perfection. However, I recommend taking it up a notch with pouring caramelized cauliflower on top. Cauliflower florets tossed in olive oil and agave. Roasted at a super high temperature. 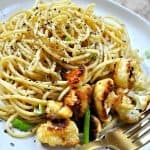 Caramelized cauliflower is one of my new favorite things, and is goes so perfectly with this vegan cacio e pepe, you will wonder how this dish is not on every menu! The sweetness of the cauliflower paired with the creaminess and spiciness of the pasta, you will wish you had it all to yourself! 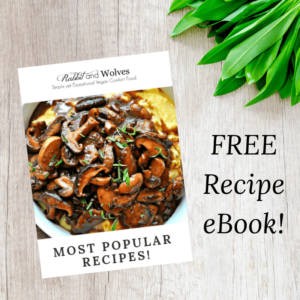 This is a super easy recipe that takes only 30-45 minutes. Perfect for a weeknight, and since it uses very few ingredients, you could probably be chowing down on this amazing pasta dish like immediately. I promise this vegan version of a classic, is totally better than the original. Super cheesy, like you will never know it is vegan. Then nice and spicy from the awesome cracked black pepper. However, I have to say, you shouldn’t skip the caramelized cauliflower. It is the bomb. Do people say “it’s the bomb”? Whatever, it is. 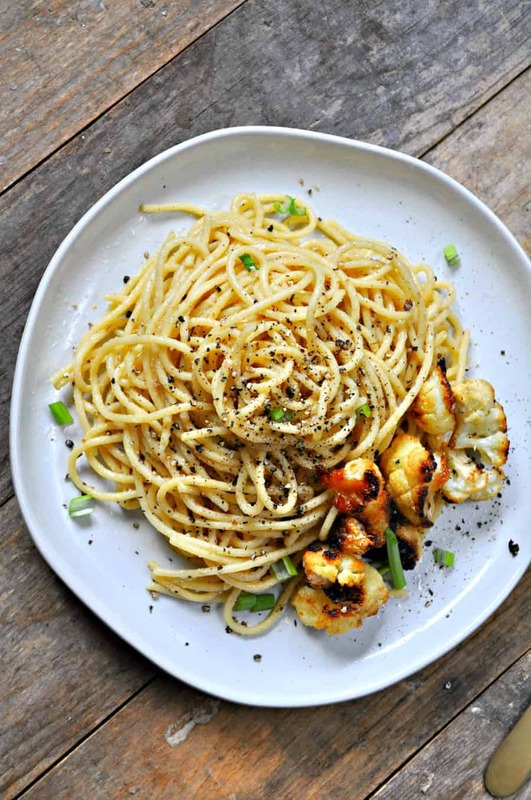 A vegan take on the Italian classic cacio e pepe. Super cheesy, a little spicy. Paired with caramelized cauliflower. It is so amazing! Get the water for the pasta on the stove to start boiling. Now preheat the oven to 425 degrees. Cut the cauliflower into florets. Then put the cauliflower on a sheet pan. Pour the olive oil and agave on top. Then sprinkle with the 1/2 tsp. salt and 1/4 tsp. pepper. Toss to coat the cauliflower in everything evenly. Now roast the cauliflower at 425 degrees for 25-30 minutes. Flipping the cauliflower about half way through. Roasting until the cauliflower is brown and caramelized. Once the water is boiling for the pasta, cook according to package directions. When the pasta is done, drain but reserve about 1/4 cup of the pasta water first. Now add the pasta back to the pot, leaving the heat off, but using the residual heat, add the vegan butter, stir to coat and melt the vegan butter, then add in the nutritional yeast and reserved pasta water. Toss to coat. Then add the fresh cracked pepper. Stir. Taste and adjust seasoning, adding salt and more nutritional yeast if needed. 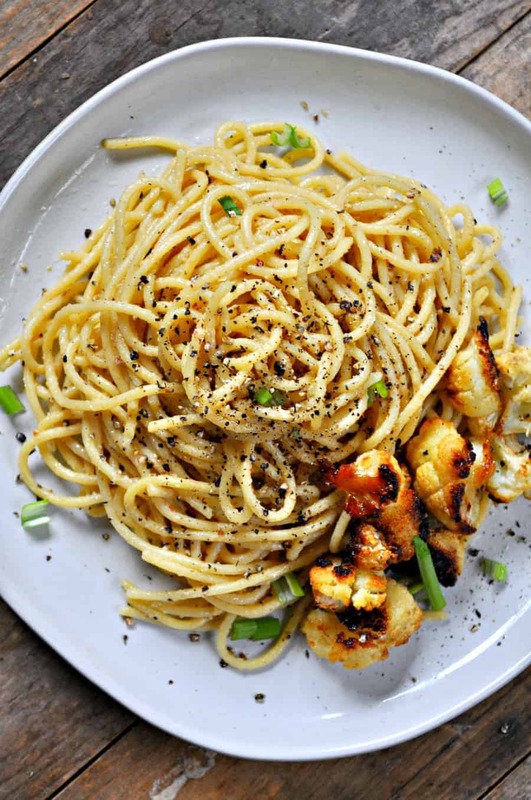 Once the cauliflower is done, add the pasta to a bowl and top with cauliflower and then a bit more pepper if desired. Serve immediately. Is there substitute for agave? Could I use maple syrup?